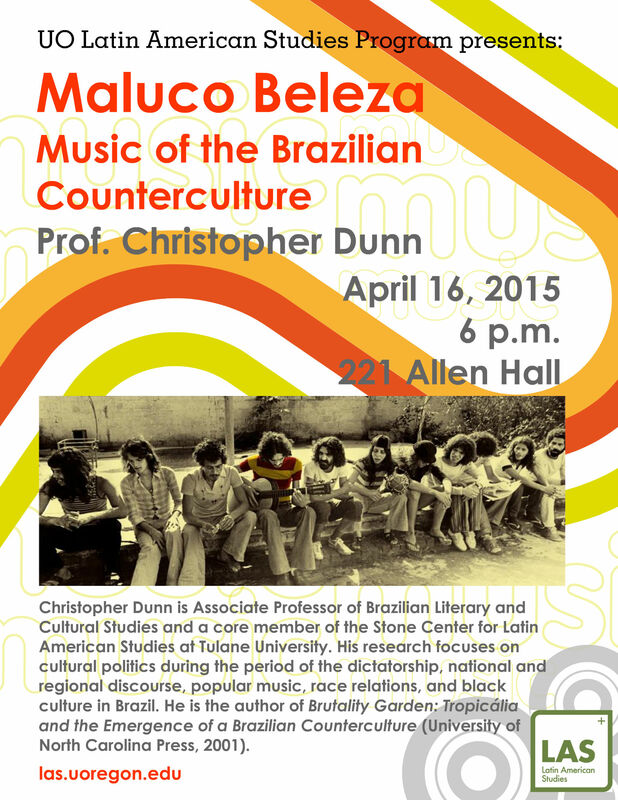 This presentation will explore the popular music associated with the Brazilian counterculture of the early 1970s This presentation will explore the popular music associated with the Brazilian counterculture of the early 1970s during the most repressive phase of military rule. In the wake of the Tropicália movement of 1968, a broad range of artists, including Gal Costa, Jards Macalé, Luiz Melodia, Raul Seixas, and the Novos Baianos created music that spoke to the despair and desire of a generation of urban youth. As the revolutionary energies of the sixties subsided, artists explored notions of personal liberation associated with the so-called desbunde, a distinctly Brazilian experience with the international youth counterculture. Monday, February 23, 2015, at 5:00 pm. 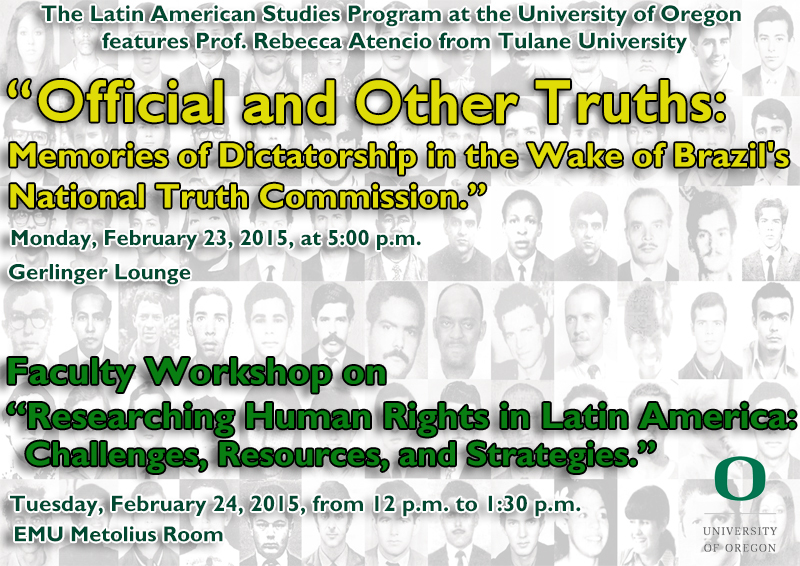 Tuesday, February 24, 2015, from 12 p.m. to 1:30 p.m.
Rebecca J. Atencio is Associate Professor of Brazilian Cultural Studies in the Department of Spanish and Portuguese, and an affiliate faculty member of the Stone Center for Latin American Studies at Tulane University. 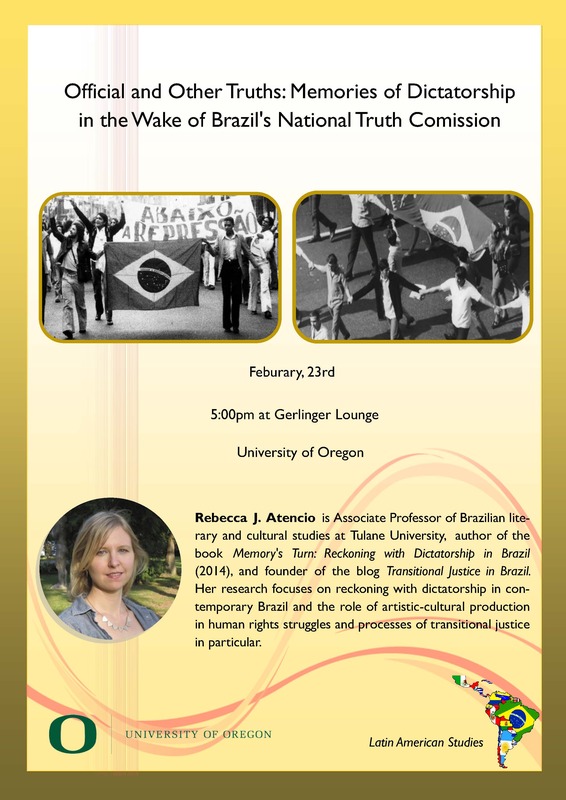 She is a member of the Executive Committee of the Brazilian Studies Association. Her research focuses on reckoning with dictatorship in contemporary Brazil and the role of artisticcultural production in human rights struggles and processes of transitional justice in particular. 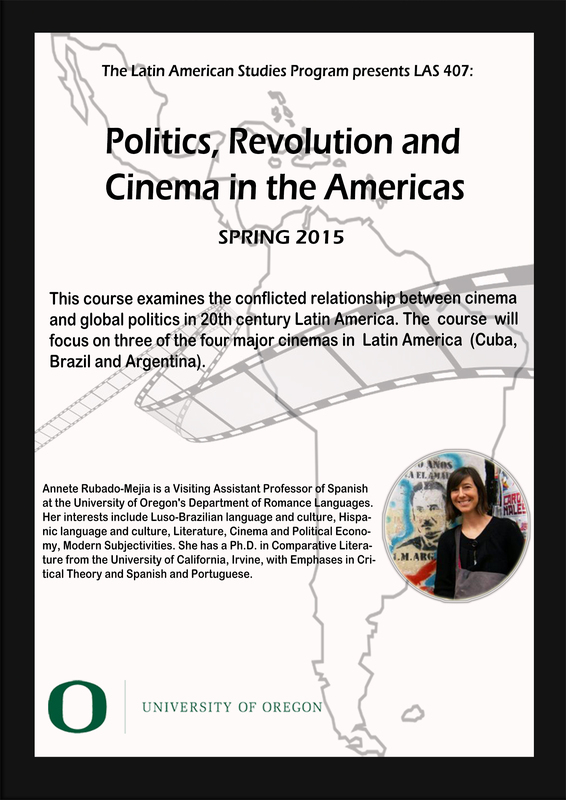 This course examines the conflicted relationship between cinema and global politics in 20th-century Latin America. The course will focus on three of the four major cinemas in Latin America (Cuba, Brazil and Argentina). 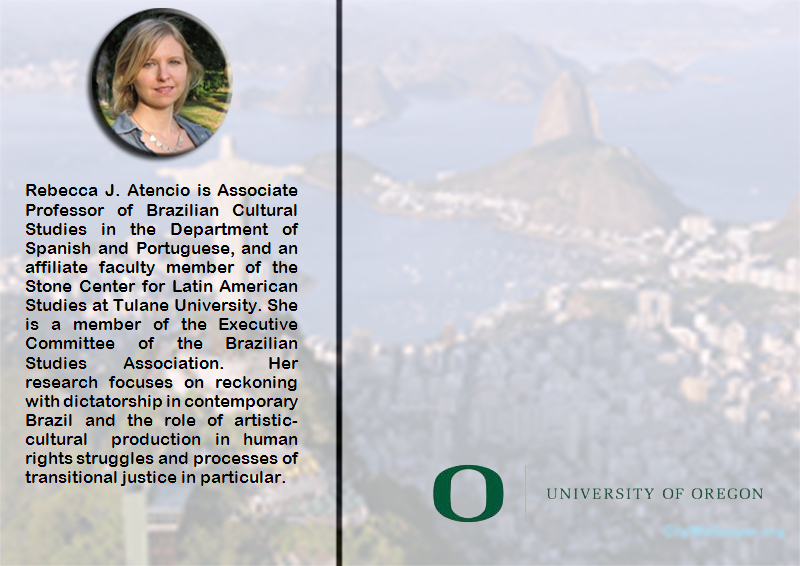 Annete Rubado-Mejia is a Visiting Assistant Professor of Spanish at the University of Oregon’s Department of Romance Languages. Her interests include Luso-Brazilian language and culture, Hispanic language and culture, Literature, Cinema and Political Economy, Modern Subjectivities. She has a Ph.D. in Comparative Literature from the University of California, Irvine, with Emphases in Critical Theory and Spanish and Portuguese.